Gold. An amazing metal that people treasure, adore and invest in. Have you ever thought about where your gold comes from? The process it takes from getting it out of the ground, and then it’s made into a piece of jewelry that you are wearing right now? 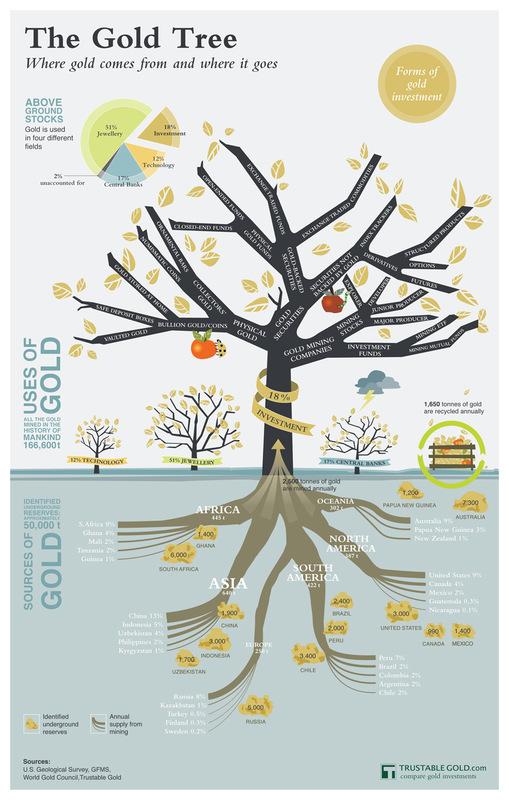 I found this interesting infographic that tells you a little bit about gold and where it comes from to get into our hands. (click the image to zoom) The majority of the gold produced is then made into jewelry. How much of that jewelry do you own right now, would you like to sell? Gold is still selling at a very high rate right now. It changes everyday, but if you are interested in selling some old or scrap gold that you have laying around, bring it by Jewelry Warehouse. We guarantee that we will give you 10% more for your gold than others. See our website for more information on how you can sell your gold with us. Click here. This entry was posted in Jewelry, Jewelry Metals, Jewelry News, Jewelry Tips and tagged Gold, gold jewelry, Jewelry, jewelry warehouse, selling gold, selling your gold. Bookmark the permalink.